Give your child a head start in numeracy! Ideal for babies and young children, Little Math is the most effective learning system for teaching your young child mathematic concepts. 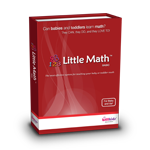 At the heart of Little Math is a revolutionary software system that delivers lessons in ways never before possible, making learning ENGAGING for your child and teaching EASY for you. Through the BrillKids Library, you can download more material to make your lessons more interesting! Download lessons prepared by other users, or download additional icon sets, and even voice and word sets in different languages if you wish to teach math in a different language.